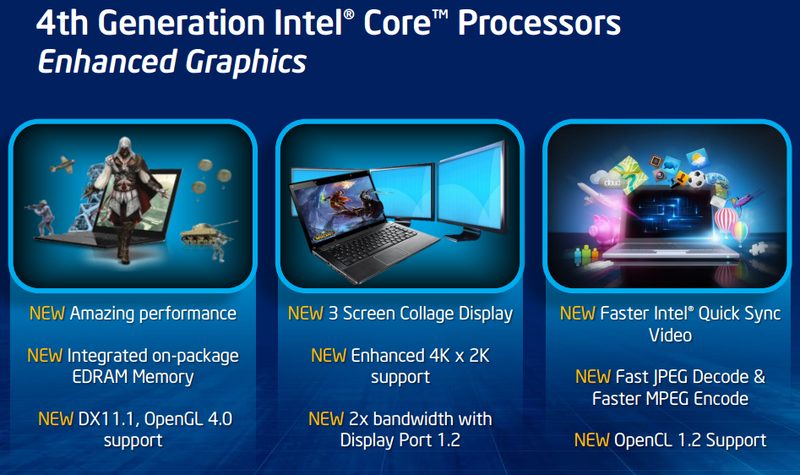 The Intel HD Graphics 5000 (GT3) is a processor graphics card included in some of the ULV Haswell processors of 2013 (e.g. Core i5-4250U). It represents the highest configuration of the integrated graphics unit (40 execution units), but lacks the additional eDRAM cache of the Iris Pro Graphics 5200. The relatively low base clock can be automatically overclocked using Turbo Boost technology. Depending on the processor model, the base and turbo clock rates may differ, resulting in varying graphics performance between CPU models. In comparison to the HD 4000, the graphics core has been modified extensively. The GPU supports DirectX 11.1, OpenCL 1.2 and OpenGL 4.0. It also features an improved decoder for 4K videos and the fast Quick Sync encoder. According to benchmarks in 3DMark 11, the HD Graphics 5000 is up to 50 percent faster than the previous HD 4000. In games, however, the performance advantage is significantly lower. With simultaneous load on the CPU, the low TDP of the ULV models (15 W) limits the Turbo Boost of the GPU. Although the HD 5000 features 40 Execution Units, the graphics performance is still somewhat below the HD Graphics 4600 with only 20 EUs (HD 4000: 16 EUs). Overall, the HD 5000 is thus just behind the AMD Radeon HD 7660G and at the level of a dedicated Radeon HD 7650M. Current games (as of 2013) will run fluently in low to medium-low settings. Due to the 22nm 3D Tri-Gate production process, power consumption is relatively low. The HD Graphics 5000 is available on certain ULV dual-core Haswell models in the 15 Watt TDP range. The HD 3000 offers 12 Execution Units (EUs) like the old Intel GMA HD but due to architectural changes each EU is now faster. The slower HD Graphics 2000 uses only 6 Execution Units. The EUs can be accessed using DirectX 10.1, OpenGL 3.0 and DirectCompute 4.1. OpenCL is not supported (the media SDK only uses the CPU). Our performance tests with the high clocked mainstream version of the HD Graphics 3000 in quad-core processors showed a performance level on par with older entry level generations from NVIDIA (e.g. GeForce 310M) and AMD (HD 5450). In comparison with AMD's APU models, the HD 3000 can only compete against the C-and E-series, but not the faster Llano and Trinity models. The quality of the Intel drivers has been improved over the years, so most games are flawlessly playable (if the minimum requirements are fullfilled). We could measure smooth frame rates in games like Dead Space 3, World of Tanks, Fifa 13, Torchlight 2, Counter-Strike: GO reach, Diablo 3, and many older games, though usually only in minimal detail settings. For accurate performance analysis and gaming benchmarks, read our article "Intel HD Graphics 3000" or scroll down in this article. Altought 2x Antialiasing (AA) is supported, the chip is as fast as when rendering 4x AA. In the Unigine Valley benchmark a i7-2637M for example reached the same score with 2x AA and 4x AA. 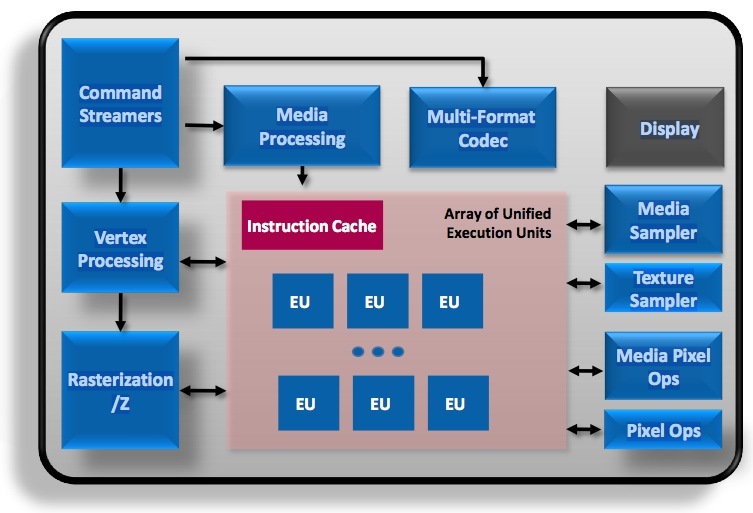 In addition to the GPU, the chip also houses some dedicated units for decoding and encoding HD videos. On the IDF Intel demonstrated the encoding of a 3 minute long 1080p video to an iPhone compatible format in 640x360 in only 14s. 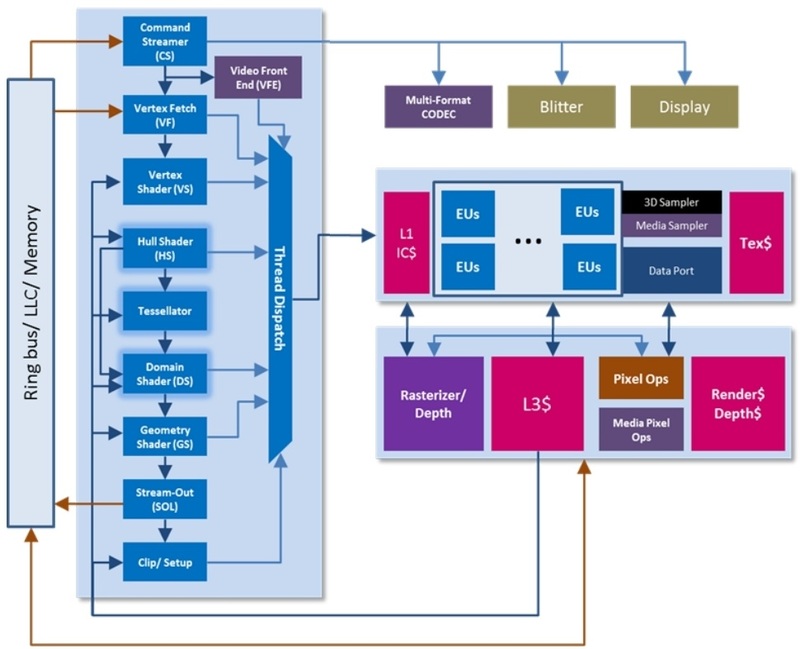 Another novelty of the Sandy Bridge GPU is the embedded DisplayPort eDP to connect internal Displays. Due to the integration in the 32nm built CPU, the power consumption of the GPU should be quite low. The Intel HD Graphics (Ivy Bridge) is an integrated graphics card in the mobile Ivy Bridge codenamed processors (Celeron and Pentium). It is the successor the the Intel HD Graphics 2000 in the Sandy Bridge CPUs and performs between the old HD 2000 and 3000 GPU. Compared to the faster HD Graphics 4000, the HD Graphics features less Execution Units (6 versus 16) and only one texture sampler. Therefore, the performance is clearly worse and only suited for low demanding gaming. Intel states a 10 to 15% higher performance compared to the old Sandy Bridge based HD Graphics 2000 (see our benchmarks below), which is similar to AMDs low-end GPUs like the integrated Radeon HD 8210. Therefore, only casual games with low requirements are playable. Another new feature is the support for up to 3 independent displays (maybe only with a DisplayPort) as AMD offers with theirs Eyefinity support (up to 6 displays). Due to the 22nm 3D Tri-Gate production process, the power consumption should be relatively low (the development was focused on performance per Watt).